We’ll provide embeds for each film, live and direct on the #Bond_age_ website sometime on Wednesday. We justify this Double Bill because Tom Cruise in real life is pretty much Scientologist James Bond. Also, he made some damn entertaining movies. 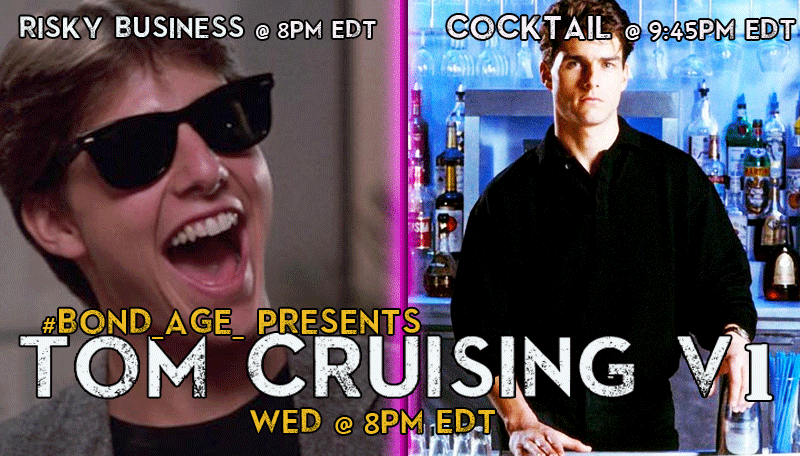 Join us for Volume 1 of TOM CRUISING! And in case you haven’t read between the lines, we plan to come up with more Tom Cruise movies to live tweet, including each of the Mission: Impossible films beginning next month. Follow #Bond_age_ hashtag and don’t forget your best Ray-Bans and brush up on your rendition of “Kokomo” by the Beach Boys. There will be a quiz afterward. To whet your appetite here’s Tom Cruise stopping by The Tonight Show for a Lip Sync Battle with Jimmy Fallon. He might have busted out the Risky Business big guns.